Once upon a time a greedy dog stole a piece of meat from a nearby house and holding it in his mouth, he began to cross the river over a narrow bridge. 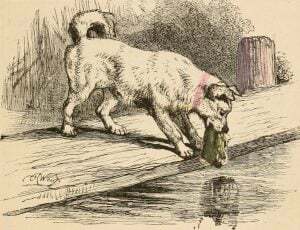 He looked down in the river and saw ‘another dog carrying a piece of meat in its mouth. The dog stopped on the bridge and looked down very carefully. He became greedy to get the other piece of meat. In fact, he saw his own image in the clear water of the river and took it for another dog. So, he howled at the image. Instantly the piece of meat fell into the water. The dog jumped following the piece of meat that was dropping. Alas! he failed to get it. He somehow swam to the other bank of the river and remained unfed.